Peter Frampton has announced dates for his first-ever acoustic tour. 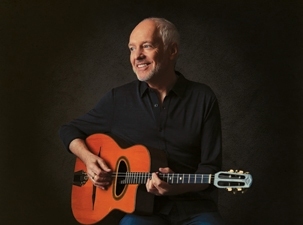 The guitarist will be joined by Gordon Kennedy – longtime collaborator and co-producer of his Grammy Award-winning album “Fingerprints” – as well as his son, singer and guitarist Julian Frampton. The 12-show run opens in Greeneville, TN on October 8. "This is a first for me and I'm very excited about doing a whole show acoustically,” says Frampton. “I couldn't do it without the help of, my writing partner of 15 years, Gordon Kennedy who will be joining me for these shows. “I see this show being 'me' performing the songs just as I wrote them on acoustic guitar or piano. I have done a lot of shows including 2 or 3 acoustic solo pieces and always enjoy the way it draws the audience and myself closer together." "I couldn't be more ecstatic about the opportunity to support a legend while simultaneously spending time with family,” adds Julian. “Two birds, one stone." Frampton is currently on the road mixing solo dates with co-headlining shows with Cheap Trick.